One of the Vive’s most prominent features is the front-facing camera, which lets you see what is in front of you even while wearing the headset. By default, this camera is used for the chaperone system, which creates virtual walls inside VR so you’ll know if you are about to walk into something. 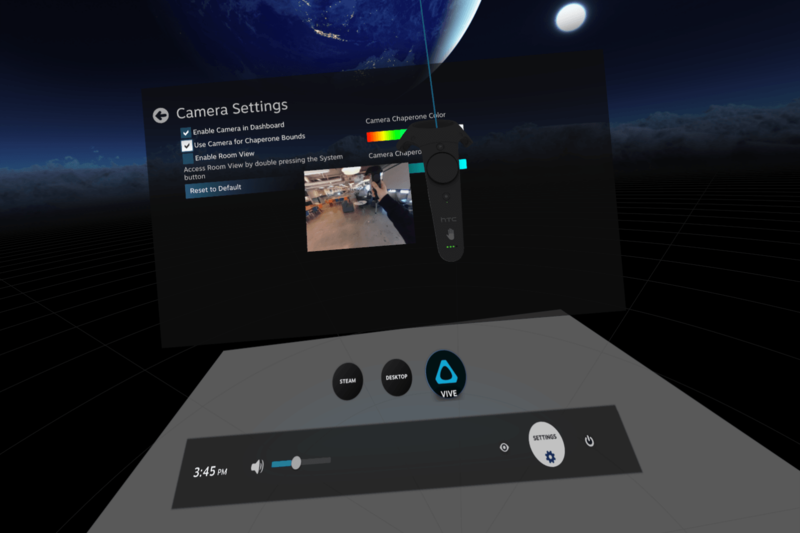 However, by fiddling with the camera settings, you can also bring up a video feed in the headset for a clearer picture of the world around you. To change the settings, first bring up the dashboard by pressing the System button on the controller. It’s the small button located underneath the track pad. Select Settings, then Camera. In the Camera settings, click the button labeled Enable Camera in Dashboard. Now, whenever you bring up the dashboard, you should see a window next to the controller providing a video feed from the camera. This way, you can see what is in front of you, which is useful if you want to take stock of your surroundings.